Part of the show Do plants get jetlag? My name is Kylowe de Pinto. I'm in grade 8 at Fish Hoek High School, Cape Town, South Africa. I listen to your talk with Redi Tlhabi on Talk Radio 702 in South Africa on Fridays whenever I can. I have to do a science expo at school and mine concerns the growing of plants. I have planted beans and have watched them grow and I would like to know what makes a plant always grow up. Like the plants and trees on the side of the mountian. I planted the bean in a pot and turned the pot upside down but it still grew through the drain holes at the bottom of the pot. At the same time planted a bean waited until it germinated and just started to come out of the soil then I turned the pot upside down and it then grew out, then to the side and up. Why is that. Why does it always go up? Hannah - So, how do plants know to grow the way they do? Over to Dr. Paul Robson, Plant Biologist at Aberystwyth University. 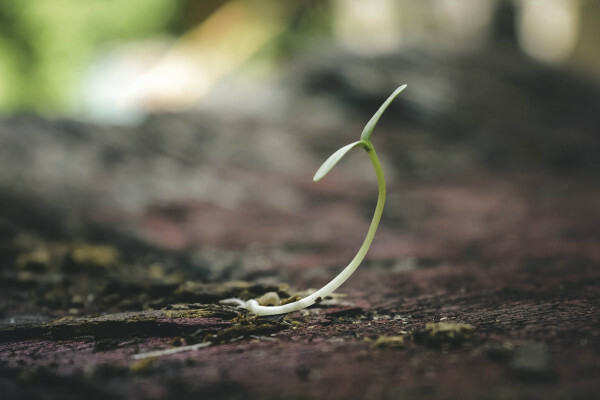 Paul - Plants grow upwards because they're trying to get to the light to begin photosynthesis, but mostly germinate underground where there's little light to follow. And so, the plants actually use gravity to tell it which way is up. They will grow upwards even in complete darkness. Hannah - Clever plants, but since leaves have no vestibular system like us humans using liquid in our ears to know which way is up, how do seeds in plants know which direction the sky lies in? Paul - We know starch is important in sensing gravity and to do this, plants package starch into structure called statoliths. The statoliths are dense within the plant’s cytoplasm in which they're suspended. So, they sink due to gravity and it’s this movement that allows the plant to tell which way gravity is acting. Once the shoots have emerged from the soil, plants change their response again and mainly use light rather than gravity to determine where they grow. Incidentally, different parts of the plant respond differently to gravity. The shoots grow upwards, but the roots grow downwards, searching for water. Hannah - And are there any other experiment we can do at home to test out this powerful effect of gravity? Paul - You can see this if you put a seed in the middle of a big pot and let it grow for a few days. Then if you turn the pot on its side and let it grow for a few more days, the shoots should curve upwards and the roots curve downwards. Plants do this because they lack basic locomotion and so, they're forced to grow towards whatever they need. John - Hi, I'm John Kiss from Oxford, Mississippi and we sent some plants into space. All week long, we’ve been giving some exciting video downlinks from the International Space Station which shows some cool new ways that plants sense light. Based on these results, we will be able to better grow crop plants in space and on other planets. Hannah - So, it’s a mixture of light and gravity cues that combine to direct plant growth that seems important for sensing gravity and the plant’s surface senses light. And even in space where there's only a small amount of gravity, plants can grow and scientists are trying to understand exactly how. Previous How do space-travellers navigate in our solar system? Next Will listening to Mozart make you brainier? What can pollen tell us about ancient plants and human impact on the environment? How does a plant sound the alarm?